NIMMONDIGE NAANU: Promise fulfilled – Tumkur has attained Ciy Corporation status! Promise fulfilled – Tumkur has attained Ciy Corporation status! It was an year back on the occasion of KANNADA RAJYOTHSAVA, I had promised citizens of Tumkur city, that we will ensure Tumkur City attains the status of City Corporation by the next year. Being the Urban development Minister and also the District Incharge of Tumkur, the task was even more exciting! Tumkur has attained the status of City Corporation.. 9th city of the state to attain the prized status.. Before handing over the prized tag, there were many pre-requisites to fulfill..
Local body should have the income of more than six crores an year. It was an ordeal task for the officers to brace up things in the time schedule of a year, I had prescribed to them..
And ultimately, here is a gift to the citizens of Tumkur city.. a new year gift.. although handed over little early! Our government has fulfilled the promise made. All the citizens including intellectuals, voluntary organisations, were yearning to see their city elevated . Those dreams have now come true! 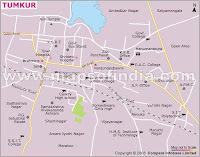 Tumkur is a city, which is growing very fast. So fast, and due to its proximity with Bangalore, it would’nt be much surprising if it attains the status of twin city to Bangalore in the near future. Now the challenge before us is to make the city of Tumkur an exceptional city Corporation and model for others to follow. Citizen friendly governance coupled with sustained development of infrastructure should really make the goal achievable. My regards go to everybody who was part of this distinguishing achievement! Sir ,hats off,It is a dream come true for all the people of Tumkur ,Tumkur is a very fast growing city due to its proximity to Bangalore. Sir there is an another wish of all people of Tumkur distict to see our beloved MLA SOGADU SHIVANNA AS MINISTER again.I think as a cabinet minister you should pressurize so that another wish also comes true. First solve the water probles..